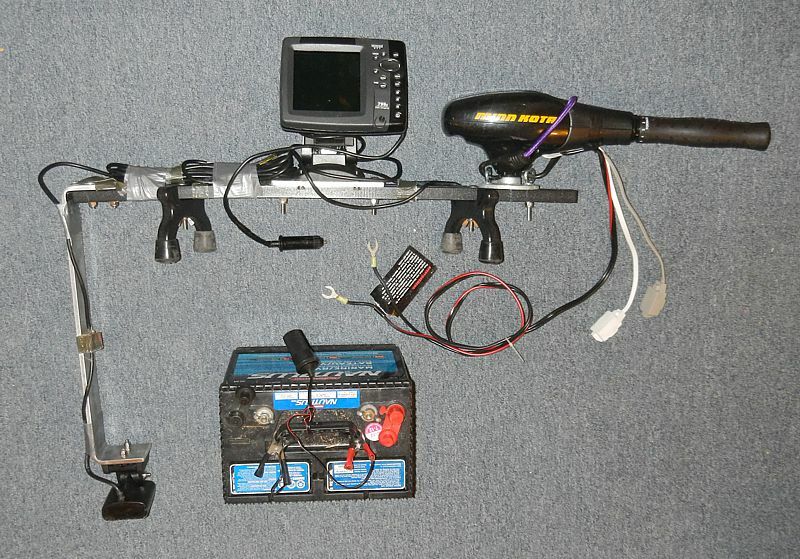 Battery, Transducer, GPS unit shown attached to the deck of the kayak. 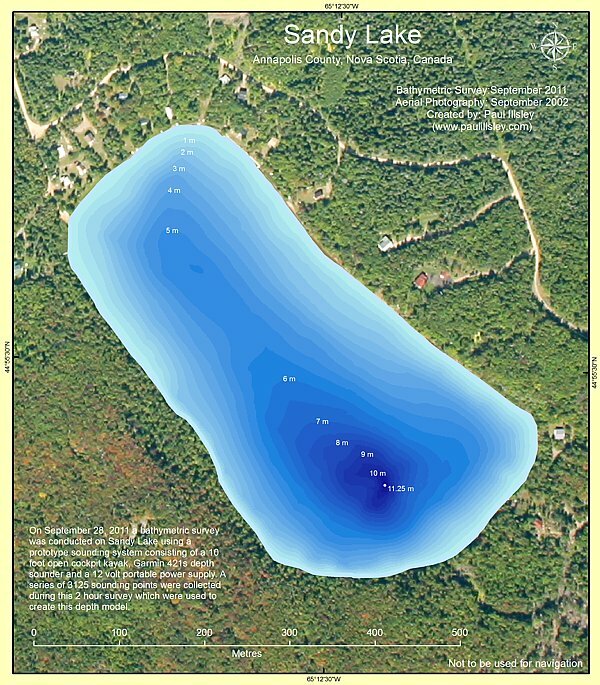 As a Cartographer and kayaker I decided to assemble a simple and easy to use kayak mounted bathymetric mapping system which could be used to create simple bottom terrain maps of local lakes. After completing the system I was asked by a number of people to document the process so others could create a similar system of their own. So here it is. 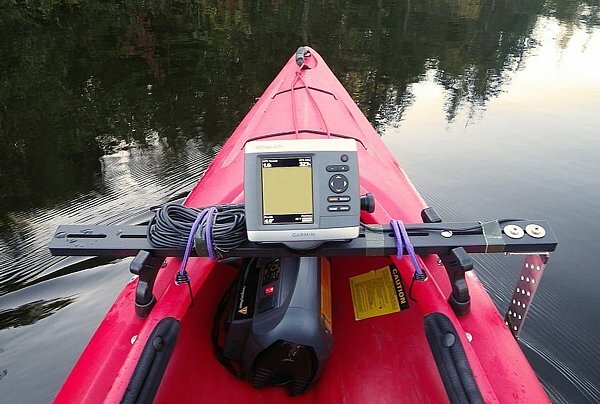 I used a Wilderness Systems Pamlico 100 kayak because of its flat bottom and open cockpit design. The length isn't as important as the flat bottom design because it's stability and maneuverability you want and not speed in this case. The open cockpit just makes it easy to get in and out of and to slide the 12 volt power supply under the front deck past the foot braces. It also has a flat ridge around the cockpit opening which allows you to mount a removable rack which will hold the transducer and GPS unit. I chose a Harmony equipment rack (a kayak and canoe accessories company) which proved to be just the perfect rig to mount the equipment on. It has adjustable leg sections which can be moved in or out along the 4.5 X 70 centimeter long mounting bar. It has numerous slots along the bar which allow you to mount the GPS unit as well as the down plate for the transducer. I used a Garmin GPSMap 421s GPS mapping sounder unit which proved to be easy to use and compact. 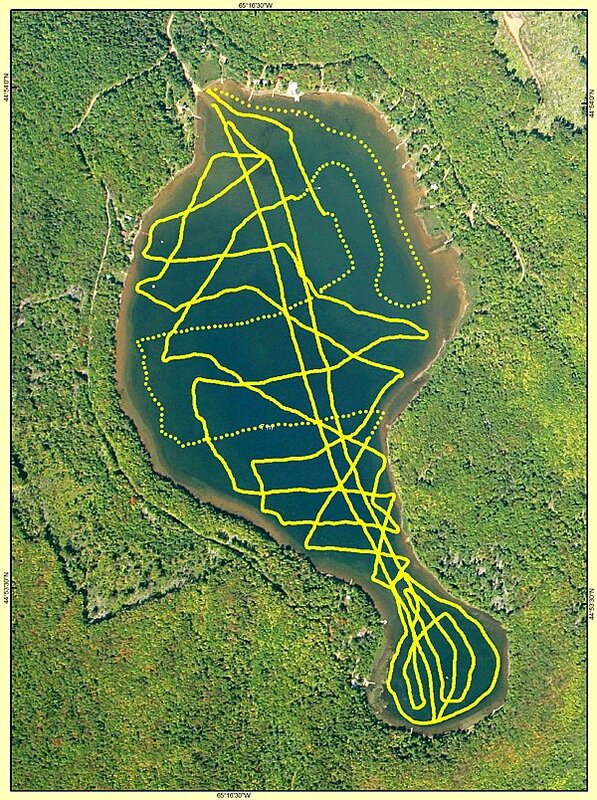 The Garmin unit has a built in WAAS corrected GPS receiver and track logger which will hold 10,000 track points. 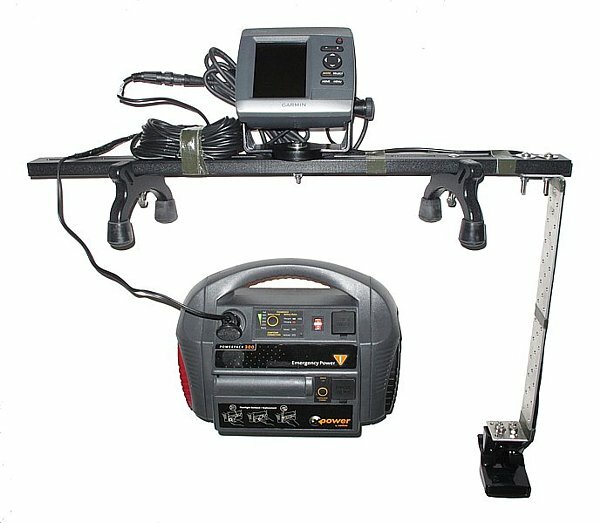 This type of GPS isn't survey grade but it is well made, really easy to use, allows for seamless position and depth logging, and it has positional accuracy to around a couple metres which is good enough for this type of general bottom mapping applications. The 421s has a nice colour chart plotter which shows you your active track and it allows you to choose the rate of logging. 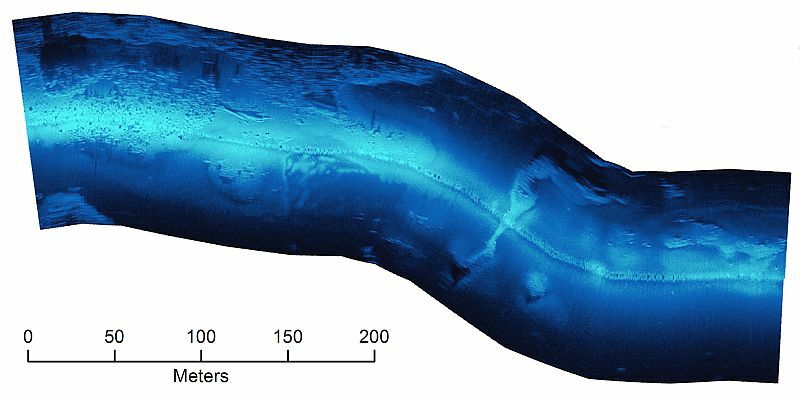 I normally choose to log a point every 2 seconds but have found that one point every 5 seconds would probably be fine except when you are trying to log the deepest point in a small area. The track points below show the 2 and 5 second logging intervals. I could easily keep a speed of about 5 km/hr with this system mounted and activated. 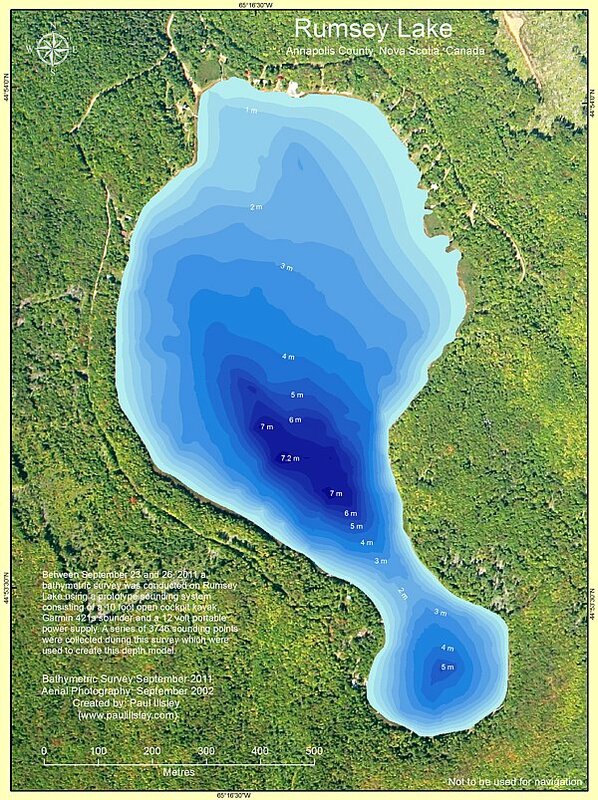 One issue was trying to get the data out of the sounder in a format that could be used in a GIS or 3D mapping software package. Garmin stores this logged data in .adm format which isn't easily extracted by most software packages. I found a software package called "GPS Utility" which could read this format and translate it into a .txt file which I could then process in a mapping software package. A number of drop-line depth measurements should be preformed each time you conduct a survey to calibrate and validate your sounding measurements. To mount the transducer I made a 5 cm wide aluminum plate which would lower the transducer 40 cm below the equipment bracket (the bar was 50 cm long before I made the two 5 cm 90 degree bends on each end). This placed the bottom of the transducer 25 cm below the surface of the water when paddling. The bar is bolted to the rack so that it cuts through the water instead of pushing against it. I used a portable 12 volt (12 Ah) car emergency power pack with a "cigarette lighter" adaptor port (enough power for the 3 hour survey). I soldered a male "cigarette adaptor" to the end of the GPS power cord so it would match the 12 volt power supply outlet. Because the transducer sits below the bottom of the kayak when in use, I made sure the entire unit could be mounted and removed from the deck of the kayak easily. 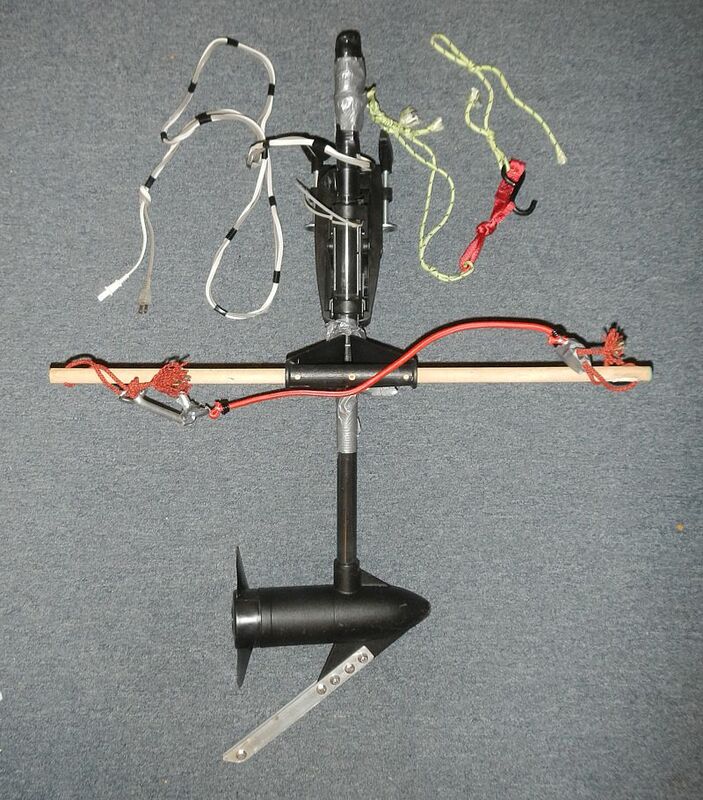 This was achieved by using two bungee cords to secure the rack to the kayak by hooking each end under the cockpit flange. This proved to be a very secure and easy method which allowed me to place the sounding unit inside the cockpit when on the beach and easily mounting the unit when I was in about 1 metre of water. I attached a small tether line to the rack in case I dropped it off the kayak when securing it. 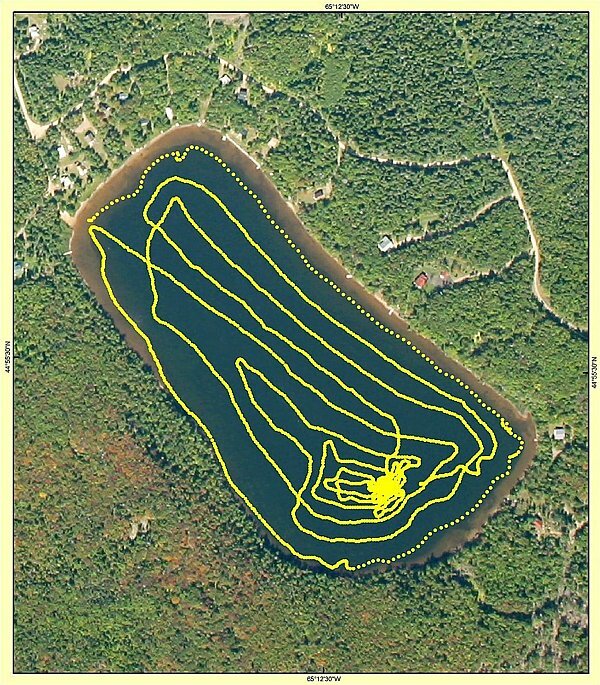 Air photo showing the sounding points for the 2 hour mapping project (3125 points).